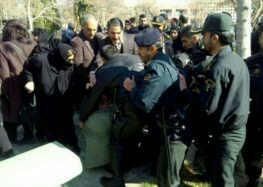 More than 150 people detained in the protests that broke out in Iran in December 2017 have requested opioid addiction treatment pills, according to the Tehran-based Committee for the Defense of the Dey 1396 Detainees. The committee’s statement follows credible reports that detainees in Tehran were told to admit to being drug addicts to speed up their release. “Out of about 400 people detained in the first three days [December 30, 2017-January 1, 2018], more than 150 asked for pills for drug addiction treatment,” the committee’s director, Mehdi Mahmoudian, tweeted on January 21, 2018. “According to prison regulations, these medications should be approved and prescribed by a doctor but the prison officials have given methadone to any detainee who has asked for it,” he added. “On the first night, the authorities at least wrote down the names of the detainees who took the pills but the following night they gave away a lot of methadone pills without documenting it,” said Mahmoudian in another tweet. “Some of the detainees who had no history of addiction have used the pills as a sedative and obviously it made them sick,” he added. Dey 1396 refers to the Iranian calendar month of December 22, 2017, to January 20, 2018—the month the protests took place. The committee, which was formed by Iranian journalists and human rights advocates, is also referred to in English as The Committee for the Defense of Detainees. Iranian authorities have claimed that two detainees who were accused of committing suicide in custody were drug addicts. The State Prisons Organization has denied forcing methadone on detainees and threatened to take “legal action” against any such allegations. The Committee for the Defense of the Dey 1396 Detainees has also reported that detainees have been subjected to physical and verbal abuse in Tehran. “One of the people who had been detained on Enghelab (Revolution) St. after a physical confrontation with the police was beaten for hours in retaliation,” he added.